Oha is made up of what is known as Bishop tuff, or, as some locals call it, tufa rock, confusing the name with that of the famous but completely unrelated calcium carbonate towers of Mono Lake, thirty miles to the north. Actually, our humble ridge is a vestige of a huge volcanic blast that took place 760,000 years ago when a 200-square-mile land mass sunk into the earth’s crust, which was followed by a rather large convulsion of geomorphic forces. The blast hurled the ground 25 miles into the sky. Chunks of Long Valley are still found in Nebraska. The great eastern escarpment of the Pacific Crest, which looms anywhere from four to five-thousand feet above our house, dwarfs our little rocky ridge. To the east, a small stream, Crooked Creek, meanders through the meadow grasses of Little Round Valley. To the west Whiskey Creek winds its way through the small town of Crowley Lake. I’m not sure how Whiskey Creek acquired its name, but there has to be some irony in the fact that in the ‘80s a rather large constituency of recovering alcoholics migrated to a church on the water’s shores. The home on Oha Ridge. LESS THAN A MILE TO THE NORTH, Oha fades into Long Valley, where Whiskey and Crooked creeks merge into the waters of Lake Crowley. Like many big valleys of the Intermountain West, Long Valley hasn’t always been drowned by water, or at least not continuously so. Ringed by 11,000-foot peaks, the crater formed by the caldera did eventually fill with runoff. When it finally breached the lip, the waters of the Owens River incised the huge flow of ash and tuff as it rushed toward the Owens Valley, 3,000 feet below. The resulting gash, the Owens River Gorge, is now a vertical playground for the growing community of sport climbers, who finesse themselves halfway up a cliff, lower to the ground, and then, like spiders weaving their webs, do it all over again. 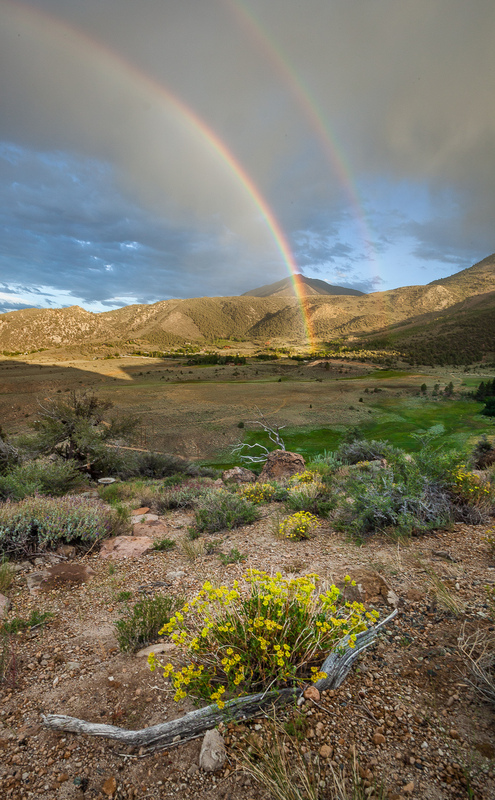 With its origins in the Long Valley Caldera, the Owens is the westernmost river in the Great Basin, and the last chance for water from that sagebrush sea to find its way to the Pacific Ocean. 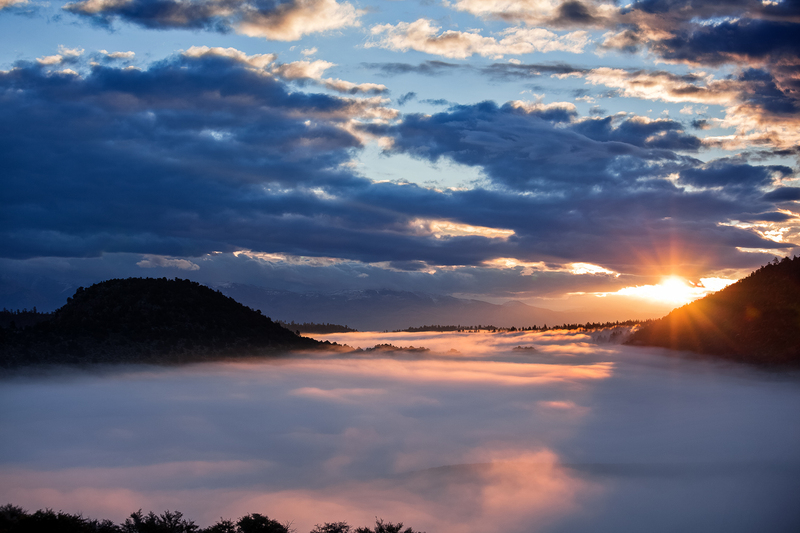 But as the explorer Joseph Walker discovered in 1833, that was not to be: the water simply vanished into air from an approximately 170-square mile terminal lake just south of Too-man-i-goo-yah, now known as Mt Whitney – the Lower 48’s highest peak. 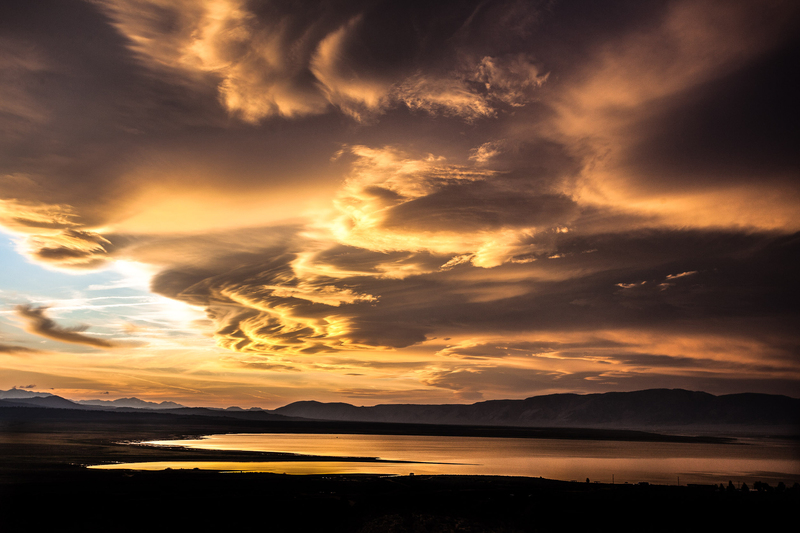 The Paiute were likely the first human inhabitants of the region. Their history is left for us to decipher in the many house rings found in the pinyon forests, as well as rock art in the valley. Their trading routes threaded the rugged canyons and were well traveled by the native peoples of the western slopes. When European explorers first arrived from the east, they found a water-rich valley in a desert environment, ideal for ranching and farming. They also found that the nomadic people living there could be easily displaced by simply running them off the land. Some Euro-American families have inhabited this landscape for several generations, and Native American tribes, of course, before recorded history. My own roots in the West are pre-Columbian (according to mitochondrial DNA), yet even after nearly four decades of living here, I am new to this valley. I AM OFTEN MET with a perplexed look when I say that I’m from Eastern California. This has less to do with the geographic quirk that actually puts Oha west of Los Angeles, but more due to the fact that the phrase just doesn’t fit the accepted geographic parlance. There are Northern and Southern California, along with the coastal strip, and sometimes Central California. But Eastern? Today, as California sprawls ever eastward from the Pacific Coast like a kind of rebound effect of Manifest Destiny, the formidable obstacle of the Sierra Nevada protects our sparsely populated pockets in the Great Basin. The geologic wall is at least as great as the political one: as sharp as the backbone of the Sierra is the divide from red to blue. 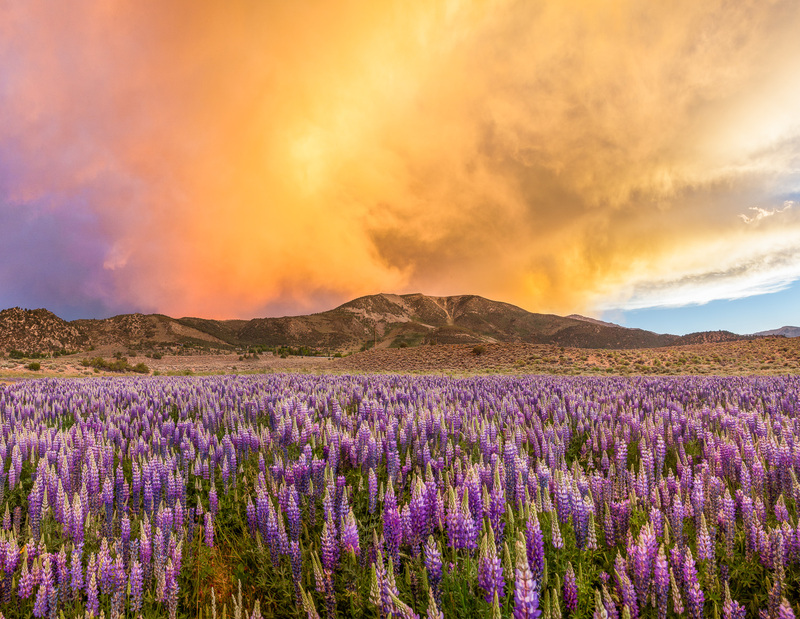 Actually, despite its conservative tilt, many of us in the western Great Basin prefer to be associated with Nevada, among the most mountainous of the States. In coming here, we chose a life where goods and services are few and expensive, and urban “conveniences” are hours away. We persevere through county meetings where, even though old and new want the rural sense of place, we seldom seem to agree. We spend our days walking that cultural and physical divide. All the same, we help tend communal gardens, watch children grow, mourn the deaths of members of our tribe. We built our home on Oha Ridge with the help of those friends. I see their prints in the plaster, feel their presence in the timbers and bales. As a biological divide, Oha is marked at its northern end by the lower tree line, where pinyon blends to juniper and then Jeffrey pine. Sagebrush, rabbitbrush, purple sage and mountain mahogany bloom and tumble down-slope toward Crooked Creek. The rounded hulk of Red Mountain looms three miles to the south. At 11,472 feet – nearly 4,000 feet above our home — it stands more like a sleeping elephant than a Bierstadt spire, but it still dominates the skyline. It’s at the top of the elephant’s back where Oha Ridge meets its first Sierra summit. CROSSING THE TWO-LANE ROAD named for the road foreman, I begin the steep, unrelenting climb up Red Mountain, past the junipers, which are twisted and gnarled by the harsh winds of the western Great Basin. Up to four feet in diameter but barely 15-feet tall, they resemble their bristlecone brothers twenty miles to the east. Farther up-slope I wade through thickets of mountain mahogany and enter a lodgepole forest. (I’d never given the name lodgepole much thought before a naturalist friend from the east said, “You’d have a hard time building a lodge of these!” Apparently, our giant, twisted Great Basin variety little resembles those of New Jersey’s Pine Barrens.) At a low saddle I walk the geologic divide, known as a contact. Here, in relatively dense forest, is the southern margin of the Bishop tuff, which soon gives way to the Sierra’s famous granite. Sagebrush scrub dotted with yellow borage and skyrocket gilia blanket open slopes between pine glens. Flakes of obsidian litter sandy benches, a lithic scatter left by those that have walked this way before. Limber pine now mixes with the lodgepole, then whitebark pine, the upper treeline species. Soon I find myself above 10,000 feet, wandering through a dense hedge of pine. Contorted and stunted by constant winds, these forests are known as krumholtz, “crooked, bent, twisted wood.” Whitebark pine’s multi-trunked clusters result from the voracious hoarding of the Clark’s nutcracker, which gathers the seeds and caches them for later consumption (they apparently have poor memories). 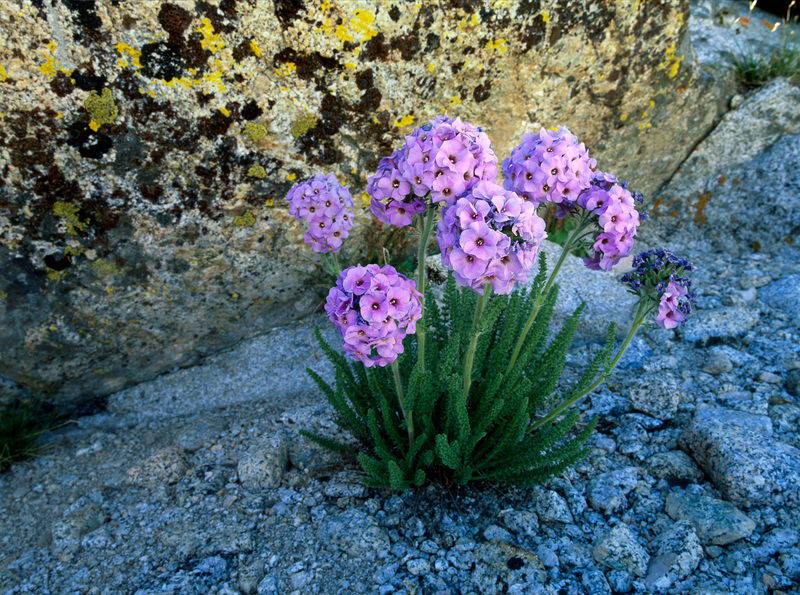 At 10,800 feet I leave the last of the whitebark to emerge on Red Mountain’s summit plateau – an alpine desert of stunted sagebrush and cushion phlox. From atop Red Mountain, Oha Ridge appears a mere spur, jutting into the vast arc of the Long Valley caldera. 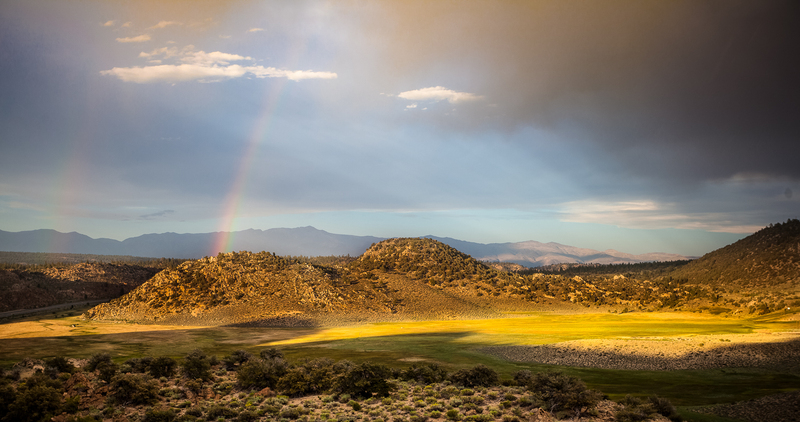 While Long Valley receives an annual average of only 12 inches of precipitation (putting it two inches above the magic number used by geographers to define an actual desert), up here, precipitation comes in the form of snow. The winds strip it from the slope almost as fast as it falls. In winter, among the rocks, leeward drifts provide water to plants that are aligned with the prevailing winds. They grow into tiny snow fences, which, in turn, collect more snow. A rock anchors the windward terminus. Topographically, Red Mountain describes the upper end of Oha, with Whiskey Creek carving west, Crooked Creek curling to the north. But the spine of the ridge still stretches several miles south before finally joining the Sierra Crest near Mt Starr. This high crest divides the much larger watersheds of the well-known Rock Creek from that of Hilton Creek. The dramatic U-shaped canyons of Rock and Hilton Creeks are big, classic, glacial-carved valleys. Compared to the little cirque glacier that swept off Red Mountain down past my house, these glaciers were the icehouses to Crooked Creek’s margarita. Upper Hilton Creek gets its start in a basin ringed by a series of 13,000-foot peaks, and Rock Creek emerges as melt from permanent snowfields at the base of a sawtoothed ridge closer to 14,000 feet. 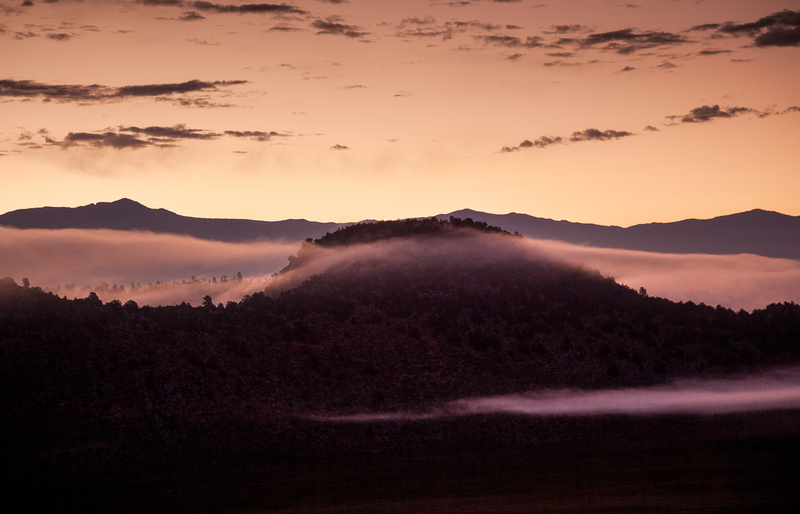 Farther south, miners desperate for riches – in this case, in the form of industrial ore – plunged into Pine Creek’s headwaters. The drainage produced the majority of the tungsten and molybdenum used during World War II. They built roads through huge talus fields to reach their adits, and those ancient, hardscrabble byways are now well-traveled hiking trails. Small tree and granite, Sierra high country. THE WINDSWEPT TRAVERSE to Mt. Starr along the Hilton-Rock Creek Divide is five craggy miles, mostly above treeline. Though much of it is easy walking, there is quite a bit of moderate rock scrambling on the ridgetop’s granite. Groveling up steep terrain bends a climber’s posture groundward, which tends to fix one’s gaze on the task at hand, such as, say, not pulling on rocks that will bring down the entire mountain on top of you. In this quadruped attitude you’re apt to see things a biped does not, like the intricacies of lichen, or the tiny yellow flower of the draba. I whiff the skunk-like perfume of the deep blue sky pilot as I claw along scree toward the summit of Patricia Peak, and its earthy musk accompanies me for the remainder of the day. A smarter man would have started earlier. It is early evening by the time I work the knife-edge above Half Moon Pass, a slight scoop in an otherwise impenetrable wall. While Half Moon Pass is generally easy scrambling, one wrong turn leads to devious terrain. I think of my friend, Eric, a competent mountaineer, who slipped and fell a few hundred feet below this point and later died from his injuries. Beneath the shaft light of alpine dusk, I traverse the arête to the summit of Mt. Starr, which requires the most attention of the day. As I climb I remember that the peak was named for Walter Starr, whose son, also an accomplished mountaineer, died in 1933 climbing in the jagged Ritter Range to the west. I suppose some wonder why we walk such a fine line between life and death in these mountains, but the question rarely passes among those who choose this life. Most of us can’t really comprehend why, let alone articulate it. George Mallory’s “Because it’s there” isn’t too far from the truth. These high points among the crags connect us to our primordial past. Some come to escape their demons, others to confront them. Many of us are haunted by these heights. Far below, I hear the song of waterfalls from the great U-shaped valley of Mono Creek. As the song flows from the depths, the water makes its own way home toward the Pacific and the setting sun. In the gloaming, the evening breeze carries sound, and it ebbs with the calm. On that easterly wind are the voices of the mountains, beyond the divide. 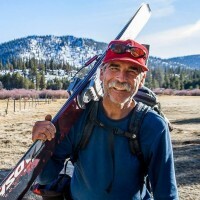 John Dittli is an award-winning outdoor photographer and writer who has climbed, skied, and explored the inner reaches of the American West. He and his wife, Leslie Goethals, live in the Eastern Sierra in a hand-built, off-the-grid home occasionally visited by a host of Great Basin rattlesnakes. 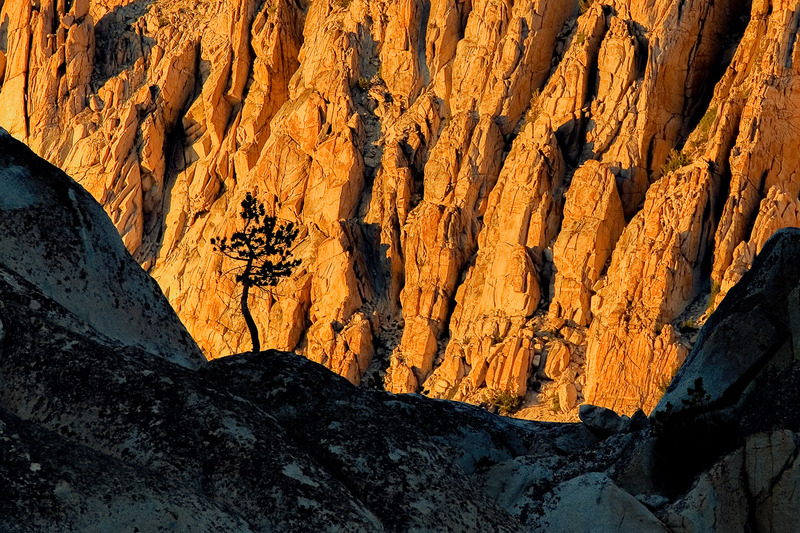 Check out John’s website for more about his photography and his book, Walk the Sky: Following the John Muir Trail. John wrote about California’s drought in April 2015: The Winter of His Disbelief. Wow, John. You are such a gifted writer. It is not hard to imagine being by your side (or right behind you). As you describe forest succession and the visible trauma left by wind and weather experienced by all life in the zones you walk and live you definitely impact my senses! Great piece! There really is no place like the Sierra. Greetings to Leslie!